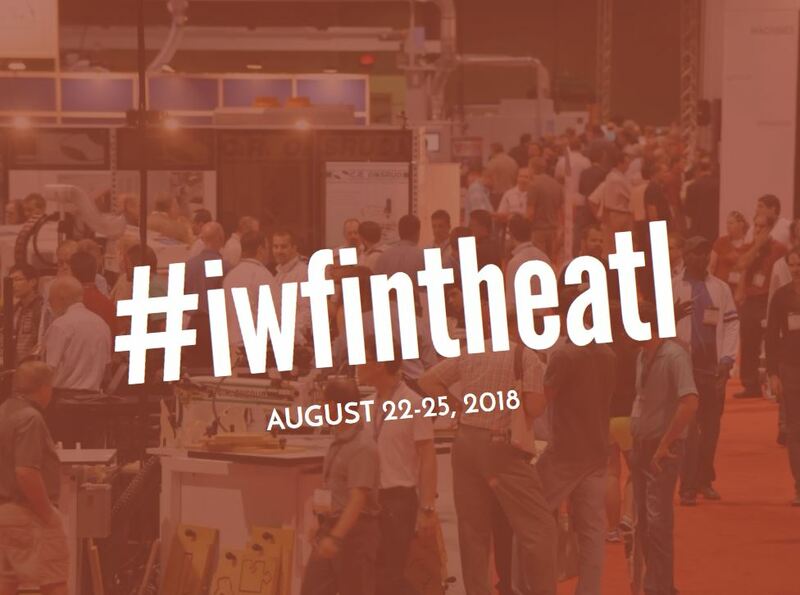 IWF 2018 (International Woodworking Fair) is a biennial woodworking show held in Atlanta at the Georgia World Congress Center. This year’s show was held Wednesday, August 22nd – Saturday, August 25th. IWF 2018 is the largest woodworking show in the Western Hemisphere and the place to see and be seen in the woodworking industry. 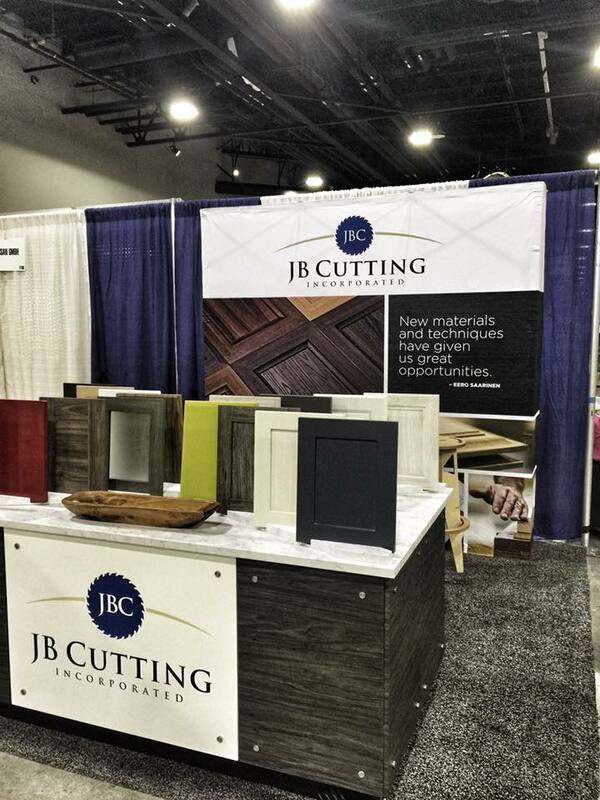 This year’s show was JBC’s 2nd time exhibiting, but we have attended every year since 1988! This year’s show started a day early for us; we caught an early flight from Detroit to Atlanta on Tuesday and headed straight to the show floor to set up our booth. We redesigned our booth for IWF 2018 this year, incorporating our shipping container into the design. The crate was skinned with 1/2″ thick panels pressed in After Hours 3DL (thermofoil) incorporating our logo onto a white pressed panel in the center. The tops were made out of 1″ thick panels pressed in Carrara 3DL (thermofoil). The pressed door holders were also in Carrara 3DL. All of the door samples, the stools and the backdrop fit into the crate for easy assembly and disassembly. Kudos to our engineering/pressing team for making this come together – great job guys! After we set up our booth, we hurried over to the Woodworking Network Leadership Forum. 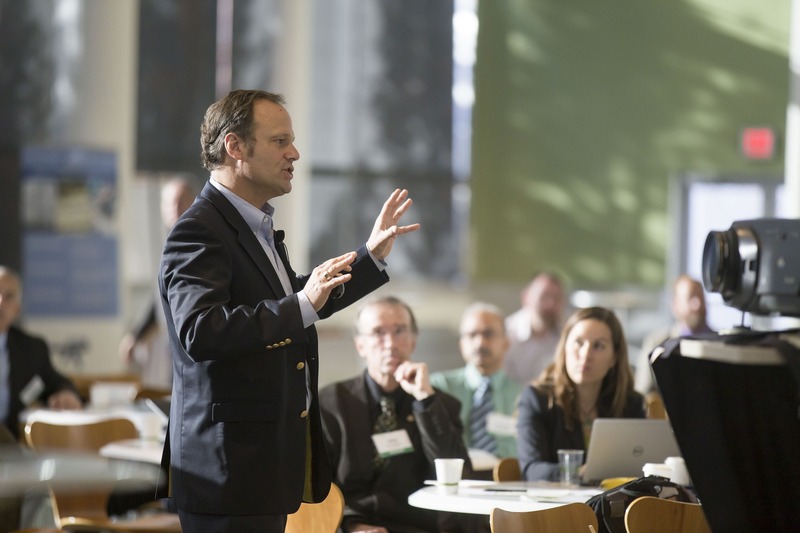 JBC sponsored this top-level conference aimed at executives from North America’s largest woodworking companies. We made it to the symposium in time to hear about RFID technology from Dave Johnson at American Woodmark. This was especially intriguing as JBC will be incorporating this technology into our parts as we grow. We also heard a presentation on Diversity in Business, from Whitney Pyle, COO/Co-Owner of JG Bowers, Inc. & Advanced Cabinet Systems. She discussed what steps to take to ensure all people become integrated and engaged in a lively forum with much audience participation. Lastly, we heard from Mike Hetherman, President/Owner/CEO of Willis, a North American Distributor. Mike’s presentation was attention-grabbing! He has unearthed two very distinct types of consumers – NEO & Traditional. The NEO drinks craft beer, goes out to eat A LOT and is a heavy internet user. The traditionalist drinks Bud-Light (or whatever main-stream beer they’ve been drinking for years) and is extremely price conscious. If you’d like to take a look at the presentation, check out this link: Neo vs. Traditional Consumer. We ducked out early missing the Panel Discussion with the 40 under 40 winners, to check into our hotel. We made it back for the cocktail reception and award presentation. After a quick dinner with peers, we called it a night! Wednesday morning, we headed out to the show, eager with anticipation. We were not disappointed! Walking in, we were in awe of all the exhibitors – over 1,000 spanning two large halls. Even though the show had just opened, there were many attendees milling about checking out all that the exhibitors had to offer. Our first stop was at our booth where we worked scanning badges and determining where our products could help potential customers. Our relief arrived in the afternoon and we got busy walking the show, seeing what new products our vendors were offering and finding the latest and greatest! One of our first stops was the Uniboard booth. Uniboard manufactures TFL (board). 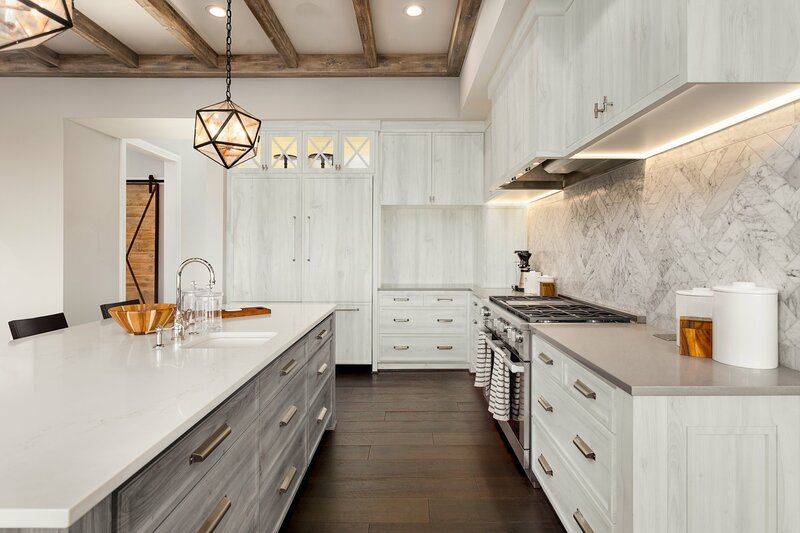 They’ve launched three new exclusive finishes produced in North America: Nobella EIR, inspired by Italy’s best modern styles, Lyra, a delicate yet complex layered woodgrain that brings craftsmanship and design to the forefront, and Vellum, a new matte finish highlighted by subtle texturing that enhances both solids and woodgrains. In a word, the launch is STUNNING! Next on our tour was a visit with one of our 3DL (thermofoil) suppliers, SSI (Surface Source International). 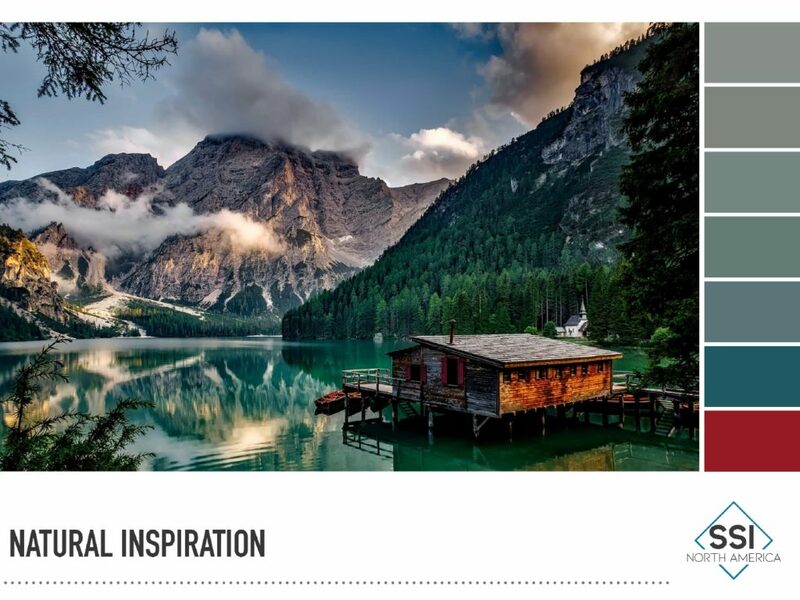 Their color focus at IWF 2018 was on “natural inspiration”. In addition to their 3DL product line, SSI supplies StyleLite and Zenolite and has an edge banding line from MTK. StyleLite is an extruded lamination-specific polymer sheet with an ultra-high gloss acrylic top layer. Zenolite is made from two layers of acrylic, co-extruded into a single sheet. A vibrant color layer is fused with a stunningly clear top layer to create a panel of incredible depth, gloss and clarity. Thanks to SSI for their hospitality during IWF; JB is proud to partner with SSI! Another 3DL vendor on our hit list was Riken USA. They’re launching new satin matte and low sheen supermatte finishes. 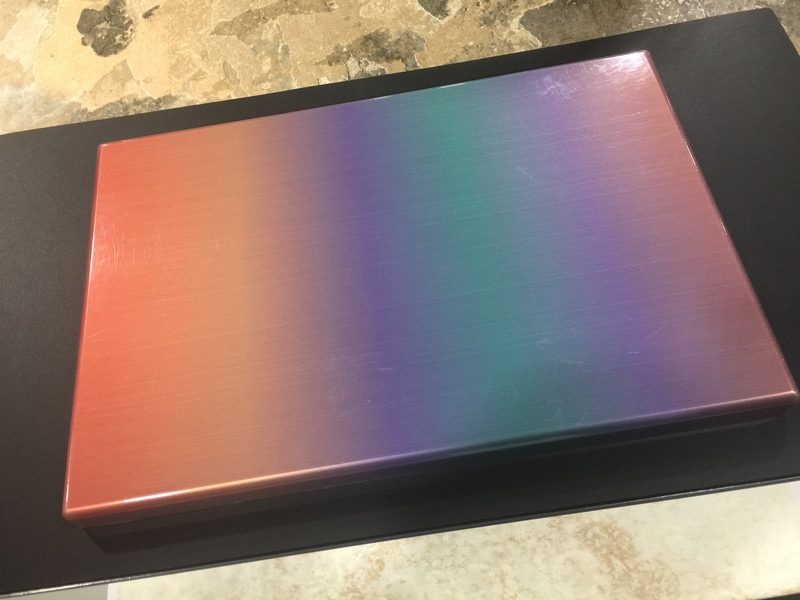 However, what really caught our eye was this printed holographic color, although this would only be appropriate to a limited audience! They’re also adding some drama with new granite patterns! We high-tailed it over to the Stevens Industries booth to check out their new colors up close and personal. 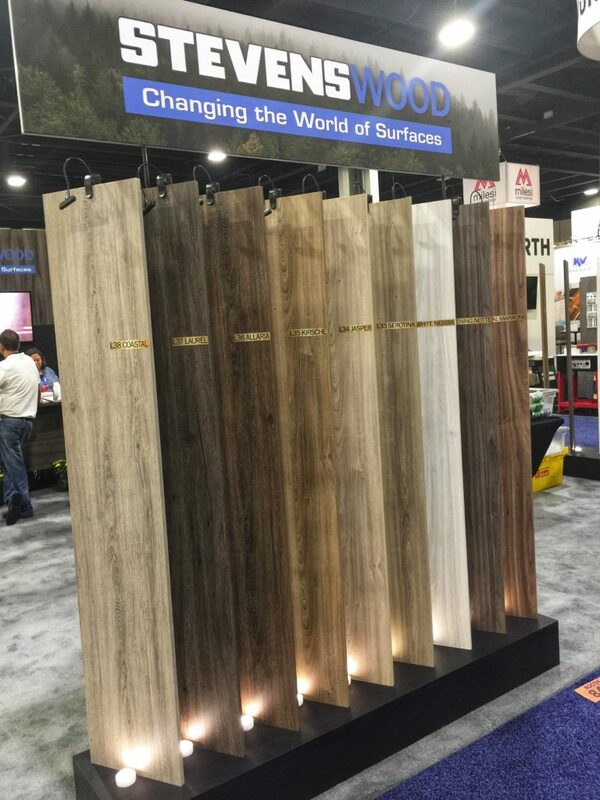 Their dual sided, registered embossed textures: Legno, Artika and Rain featured prominently in their booth. White Nebbia is one of our favorites of the new launches, nature would be flattered! After the show closed, we attended the Surfaces Reception at the Georgia Aquarium, sponsored by Surface & Panel Magazine & Sierra Forest Products. This reception is the place to see and be seen! Thank you to Uniboard for providing us with tickets. 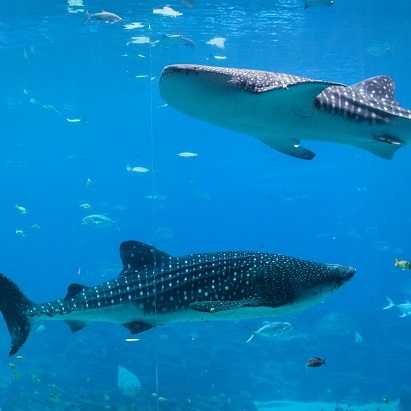 We networked and enjoyed seeing the whales and large variety of fish. The evening wrapped up with an enjoyable dinner with one of our adhesive vendors. Join us next week as we continue our adventures in HOTLANTA!